The valley of the River Erewash, which forms a border between Derbyshire and Nottinghamshire, is remarkable mainly for being unremarkable – a wide flood plain with a diminutive stream meandering across the flat meadows. Its market towns perch on the hills above – Heanor, Ilkeston and Eastwood – the last of which associates the area with the epithet “the Lawrence country”, for here the young author, David Herbert Lawrence (1885-1930), known round about as “Bert”. grew up in what he later called “the country of my heart”. Lawrence’s childhood, described in such novels as Sons and Lovers (1913), was the heyday of the local coal industry, now gone, which began when a couple of canny eighteenth-century landowners, Robert Barber and Thomas Walker, eyeing their Leicester competitors’ efforts to gain a waterway from their coalmines to the River Trent, obtained an Act of Parliament in 1777 to build the Erewash Canal from the Trent near Long Eaton to Langley Mill, which sits in the valley between Heanor and Eastwood. They engaged the Heanor-born John Varley (1740-1809), surveyor and resident engineer of the Chesterfield Canal, but despite his achievements building the 2,850-yard Norwood Tunnel and the great flights of locks at each end of it, his reputation was questionable and after he mistook the levels at the top of the canal he was dismissed. Construction of the canal was in fact straightforward – a waterway of fourteen broad locks with a single low aqueduct over the River Erewash near Shipley. Despite the difficulty with the top lock, the canal cost £21,000 – a couple of thousand pounds below budget – and opened ahead of schedule. Not only did the Erewash Canal open up the coalfield along its course, but it prompted the construction of a whole network of connecting waterways – the Cromford Canal (1794) and, with the same year, 1796, three further waterways, the Derby Canal, the short Nutbrook Canal and the Nottingham Canal, which made Langley Mill a three-way junction providing the Cromford Canal with a shorter, competing route for traffic heading downstream on the Trent. Erewash Canal shares were worth having: when the first railways appeared in the area in 1839-40, its dividends slumped from 64% to 45% in 1841, and remained above 21% for the following fifteen years. Indeed, the canal remained independent until it was nationalised after the Second World War. 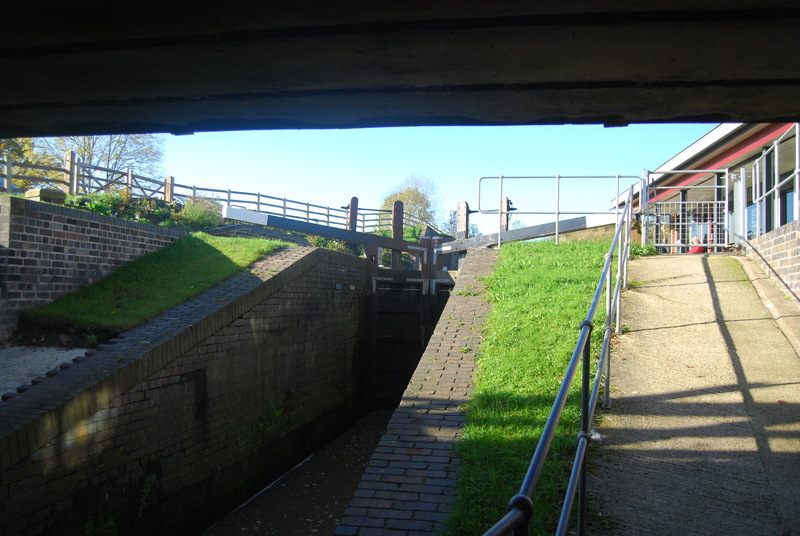 While the other local canals declined and closed, the Erewash Canal had the advantage that its direct connection to London by the Grand Junction and the Old Grand Union canals remained free of railway ownership. Barge traffic eventually ceased in 1952 and British Waterways nominally closed the top section of the Erewash Canal in 1962, but had to maintain it in order to supply water from the Nottingham Canal’s Moorgreen Reservoir for navigation in the lower section and to supply Stanton Ironworks. Members of the Inland Waterways Association, having lost the battle to keep the Derby Canal open, formed the Erewash Canal Preservation & Development Association (ECP&DA), leased the threatened lock cottages at Sandiacre and organised working parties to keep the waterway navigable. In 1971-1973 the Association reclaimed the derelict terminal basin at Langley Mill, reinstating the connections with the moribund Cromford and Nottingham canals. The importance of this restoration work cannot be overstated. Apart from keeping the Erewash Canal open to pleasure craft, the Association’s work makes possible the ultimate restoration of the Cromford and Derby Canals, however many decades each might take. But for the foresight of less than a dozen individuals in the late 1960s, the canals of the Erewash valley would have been quite literally gone and forgotten. The Waterways & Railways of the East Midlands (September 3rd-7th 2018) tour includes visits to the Great Northern Basin and the Sandiacre Lock Cottages. For further details please click here. This entry was posted in Transports of Delight, Waterways & Railways of the East Midlands on June 26, 2018 by Mike Higginbottom. The Waterways & Railways of the East Midlands (September 3rd-7th 2018) tour will visit the Hollingwood Hub centre to hear about the forty-year restoration programme that has returned all but nine miles of the Chesterfield Canal to navigation. I remember the wrecked state of this canal in the 1970s, and I’ve marvelled at the inspiring work of the Chesterfield Canal Trust in bringing water and boats back to long-abandoned stretches of waterway. The first practical preservation project was the restoration of Tapton Lock on the outskirts of Chesterfield, completed by the Chesterfield Canal Society in 1990. This led to the restoration of Hollingwood Lock, near Staveley, in 1993. By 1997, when the Society became the Chesterfield Canal Trust, further locks had been restored, and the visitor centre at Tapton Lock opened. The section between Worksop and Shireoaks reopened in 1998, and the entire length from Worksop to the east portal of Norwood Tunnel, including twenty-two listed but dismantled locks, was restored to navigation by 2003. Major landmarks in the restoration campaign were celebrated – the opening of the Shireoaks Marina by HRH the Duke of Gloucester in 2000, the completion of navigation between Chesterfield and Staveley in 2002, the opening of the Hollingwood Hub centre in 2011 and the opening of Staveley Town Basin the following year. Several obstacles stand in the way of connecting the two restored navigable sections of the canal – a 1970s housing development at Killamarsh, the M1 motorway and the collapsed Norwood Tunnel. The Chesterfield Canal Partnership, a consortium of local authorities working with the Trust and others, has developed feasible plans to deal with each of these difficulties over the nine remaining miles of abandoned waterway. Restoring navigation north of Staveley, where an 1892 mineral railway bridge left insufficient headroom for canal traffic, necessitated constructing a dropped pound between two new locks, Staveley Town Lock, no 5a, and Railway Lock, no 5b. The intention is to restore the surviving eastern section of Norwood Tunnel, leading to three ponds, created in the landscaping of the former Kiveton Park Colliery, capable of being developed as a marina. Beyond a 400-metre intact length, the Norwood Tunnel is irretrievable because of subsidence, infilling by the National Coal Board and the construction of the M1 motorway in the 1960s. Instead, a new surface channel is proposed, using an existing farm-road underpass to cross beneath the motorway, with a cutting and locks to reach the level of the existing tunnel and the summit pound at Kiveton Park. Some aspects of the restoration plans were compromised by the announcement in 2012 of the preferred route for the HS2 railway line. Four-and-a-half years of campaigning by the Trust, strongly supported by members of the public, contributed to the decision to reroute HS2 to an alignment to the east. Forty years of hard work have demonstrated the practicability of restoring a completely abandoned waterway, yet there is still much work to do. Other restorations, such as the Kennet & Avon, Huddersfield Narrow and Rochdale Canals, have led the way; other mutilated waterways in the Trent Valley – the Cromford, Derby, and Grantham Canals – will return to navigation, even if they take decades to accomplish. Hollingwood Hub is owned by Derbyshire County Council and operated by the Chesterfield Canal Trust as a resource for members of the public to use: http://www.chesterfield-canal-trust.org.uk/restoration/hollingwood-hub. The coffee shop is open from Wednesday to Sunday and on Bank Holidays. The Chesterfield Canal features in the Waterways & Railways of the East Midlands (September 3rd-7th 2018) tour. For further details please click here. This entry was posted in Transports of Delight, Waterways & Railways of the East Midlands on June 10, 2018 by Mike Higginbottom. The South Yorkshire Transport Trust at Eastwood, Rotherham, is a much more hard-core enthusiasts’ affair than its companion down the road at Aldwarke. Its occasional opening days are populated by individuals of a certain age brandishing serious cameras – a stereotype I find it remarkably easy to fit into – and these events seem to attract visiting vehicles from far and wide. Formerly located in the former Tinsley Tram Sheds, in 2017 the collection moved to a former nut factory. (There’s a health-warning about allergies at the entrance.) It’s a businesslike location that already looks and smells like a bus garage – fragrant with diesel oil, rubber and sun-dried upholstery. The core fleet is considerable and includes an immaculate village bus of 1963 from Cyprus, an American school bus dating from 1989, as well as buses that operated away from South Yorkshire – Devon General, East Kent, Eastern National, Lothian and Greater Manchester. There is an impressive collection of South Yorkshire double-deckers mostly from the 1970s, 1980s and 1990s, many of them awaiting full restoration. In some cases, their parlous condition is the result of vandal attacks when they were stored in the open. The Eastwood site offers much better security. Among the stars of the collection is Sheffield 874 (7874 WJ) of 1960, a tram-replacement vehicle that notched up sixteen years in public service followed by over forty years in preservation, and has run in every single one of those years. If South Yorkshire ever instigates an authentic heritage bus service, as London has, here is the fleet. The Trust’s website is at http://www.sytt.org.uk. This entry was posted in Transports of Delight on June 2, 2018 by Mike Higginbottom.